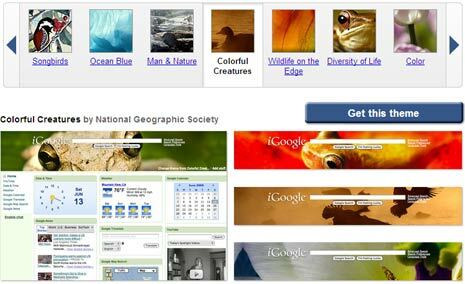 iGoogle has introduced new set of fresh, cool looking nature iGoogle theme series. Contents of these themes come from organizations and photographers know for worlds best nature photography including: National Geographic Society, BBC and Ansel Adams Gallery. Whole collection has number of themes presenting different aspects of mother nature. It has it all, from colorful land creatures, sea scenes to beautiful landscapes. Just go Nature theme iGoogle pageand select theme of your choice. Click on get this theme button and your iGoogle webpage with sport that selected nature theme. It is colorful and very pleasing to eyes, grab your favorite iGoogle nature theme or try creating own iGoogle theme with 3 cool tools.